Treasures from Shanghai: 5,000 Years of Chinese Art and Culture featured 77 sets of objects from the Neolithic period (circa 3000 B.C.) to the Qing dynasty (1644-1911 A.D.). 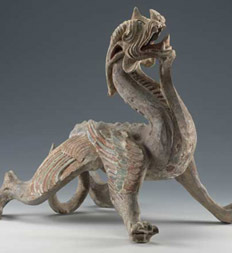 This incredible collection, on loan for the first time from the acclaimed Shanghai Museum, portrayed the evolution of Chinese technology, art and culture utilizing rare examples of bronze vessels, oracle bones, polychrome potteries, sculptures, porcelains, paintings, jade/bamboo carvings and lacquer works. It was only the third collection ever brought to the United States from the Shanghai Museum and the first in more than 20 years.